At the age of 24, my family was given a huge reality check when we tragically lost our lovely mum. Experiencing something so life-changing definitely puts things in perspective, and what was previously a high priority suddenly takes less precedence. For me, schlepping up and down the country as a very well-aid National Accounts Manager for the hotel industry was now nowhere near as significant as being with my family. That’s when I had the bright idea of setting up my own business. Armed with my industry knowledge and management expertise, I knew I was more than capable of running my own company. But as I lay in my hotel room, night after night, thinking about it, I really doubted myself. Thankfully, after lots of discussions with my brilliant, business-savvy, super-successful dad, and many more sleepless nights, I took the plunge and began my entrepreneurial journey on 1st January, 2000. Anyone who runs their own business will have plenty of stories about the extreme highs and lows, and I’ve had my fair share. It’s a rollercoaster adventure which often flies at a scary pace, but it brings lots of lessons every day and that’s all part of the fun. Here are 18 of my favourite lessons and snippets of advice which I hope will help you too. Less worry, more action: it’s good to get started. Don’t put off your decision to start your business. Try to shush those ‘what-ifs’ that run around your head, take a deep breath and be brave. You can do this! Believe in yourself: self-doubt will keep you stuck, squish your creativity and put a ceiling on your potential. Do whatever it takes to kick those mind monkeys into touch, and your confidence will steadily grow. Don’t underestimate the power of networking: you might not be everyone’s cup of tea, nor they yours but once you find your right-fit kind of business community (both online and off, by the way), you’ll never feel alone or stuck again. Business plans, schmisness plans: creating a business plan is pretty important (yes, Dad, you have drummed it in) but what’s more important is getting stuck in. You can spend oodles of time writing the perfect business plan, but don’t get so bogged down with it that you forget to make it a reality. Go with the flow: as your business grows (and you, for that matter) you’ll need to adapt to change. If you don’t, you’ll stagnate. Change is a given if you want to blossom in business. Find your perfect-fit coach: I thought I could do this business thing all by myself for years. It’s only when I found my perfect-fit coach that I realised how many wrong decisions I’d made. Now, I’ll never be without one. Find a fab accountant: accounts don’t excite me and they steal so much of my time, so it makes much more sense for me to let an expert handle them. It leaves us both to pursue our passions, and I can sleep soundly at night knowing I’m not going to miss any legal deadlines or payments! Stay sensible about your products: if you’re a product-based business please don’t be too precious about holding out for price. Instead, liquidate your stock when needs be and you’ll keep that all-important cash flow trickling. Without you there is no business: take care of you, be kind to you, and prioritise time out because without a happy, healthy you, your business won’t function. Do what you love: yes, we all have to earn a living but if you can run a business that you’re passionate about you’ll never get that Monday morning sinking feeling again. Above all else, be happy. 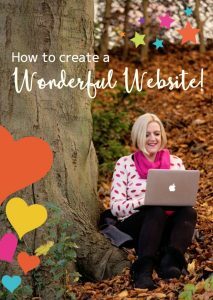 Don’t put off getting a website: your website is the very heart of every business these days for both online and offline companies. So prioritise the building of your website (even if your budget is tight), maintain it regularly, and update it consistently. Ditch the overwhelm: overwhelm never serves you!, and the sooner you learn to kick it into touch the quicker you’ll start to make those big business leaps. Keep moving forward: even on the crappiest days when you question what the heck you were thinking about, keep going. Tomorrow’s another day to start again. Haters back off: without a doubt people will judge you, but that’s their issue. Don’t listen to any negativity, or ‘advice’ that doesn’t serve you. You’re in charge, your rules, your business. Set your time boundaries: working 24/7 is not cool. It brings out the worst in you, which ricochets on those you love and work with. Evening and weekend working will make you a very dull girl (or boy) and as tempting as you think it might be to sneak in an extra hour or two, it spells burn-out in the long-term. You are not chocolate: you cannot keep everyone happy all the time. You cannot be all things to all people, so don’t even try. Never forget you: always, always, always be you. People will respect and appreciate and love you so much more when they see ‘you’ in your business, instead of a bland ‘professional business owner’ caricature. Don’t be afraid to be you. Being an entrepreneur is fun, exciting, and scary all rolled into one. And despite some of the harsher lessons I’ve learned, I will never ever be someone’s employee again. Embrace your business, be brave if you need to, but bear these lessons in mind. They’ll stand you in good stead.